What type of Bible would appeal to visually engaged millennials who care about beauty but are walking away from religion? That’s what two friends pondered a few years ago when they launched a Kickstarter campaign for Alabaster, their new publishing company. Now their pricey volumes of attractive Scripture have grabbed the attention of the so-called selfie generation, with projected sales of almost $1 million this year. Brian Chung, who converted from Buddhism to Christianity while at the University of Southern California, later became a campus minister with Intervarsity Christian Fellowship. Dismayed by students’ flippant reaction when he handed out New Testaments, Chung thought, “There must be a better way.” His own first Bible had felt intimidating, he remembered, with tiny font and archaic phrasing. 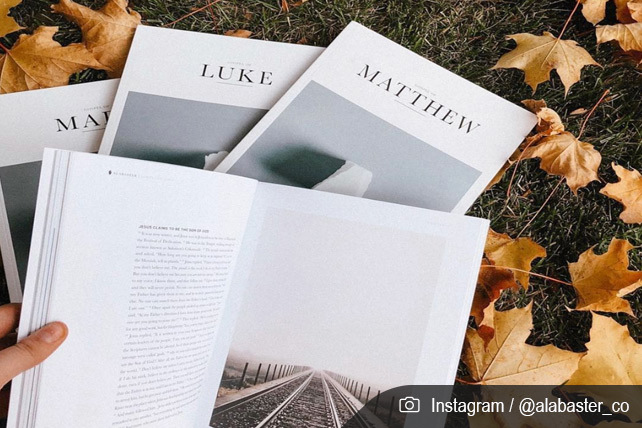 Chung befriended another Christian with a similar name—Bryan Chung—and they partnered to create Alabaster, which “explores the intersection of creativity, beauty, and faith through original artistic content.” The company’s Bible books contain attractive layouts of Scripture text and soothing, Instagram-worthy photos.